In common with all the children of William and Catherine Booth, the founders of the now world-wide Salvation Army, Evangeline, their fourth daughter, was early trained to take her share in the work of the organization. She was born December 25, 1865. When she reached the age of eleven years her mother, in writing to her, urged her "to read, write, sum, practice, talk French, and learn lessons, all for this - to help the weak and poor, the ignorant and the wicked." She reminded her at another time, of her beautiful name and expressed the hope that her life might put its meaning into action. To one familiar with the mother's remarkable history and character there can hardly be occasion for surprise that the women should become a women of strong and forceful influence. At the age of fifteen, it is reported, Eva Booth spoke "beautifully" at a meeting at Stoke Newington. Apparently, thus early she was developing the rare gift of eloquence which she now possesses. At seventeen she was made an officer in the army and commenced her work in the slums. In these days contempt and even insult was the portion of those who associated themselves with the Salvation Army. It had not them so fully proved its fitness for its chosen sphere of work or received that recognition from the more cultured classes which it now enjoys. But the intense sympathy of Miss Booth for the poorest of the poor - not, as she herself says, those who call themselves poor, but those who are really so, who earn but five or ten cents a day - made her willing to endure both taunts and sneers. Eva Booth was next placed in charge of the training school for women officers in London. Later she was appointed to the field commissionership of the work in Great Britain. In 1896 she was transferred to Canada. As Commander-in-chief of that branch of the army, her fine organizing ability has had full scope. As soon as the way to the Klondike was open, and before there was a railroad to Dawson City, she sent six men adapted to the work, and two nurses, as pioneers of the army in that region. Sometime after she herself visited Alaska and sang "Home Sweet Home" to the miners in the streets. Two special features of her work in Canada have been that done for the prisoners and what is called detective work - the finding of missing men, women and children, and restoring of them to their friends. But the impress of her character and personality has extended beyond the limits of the organization she commands. 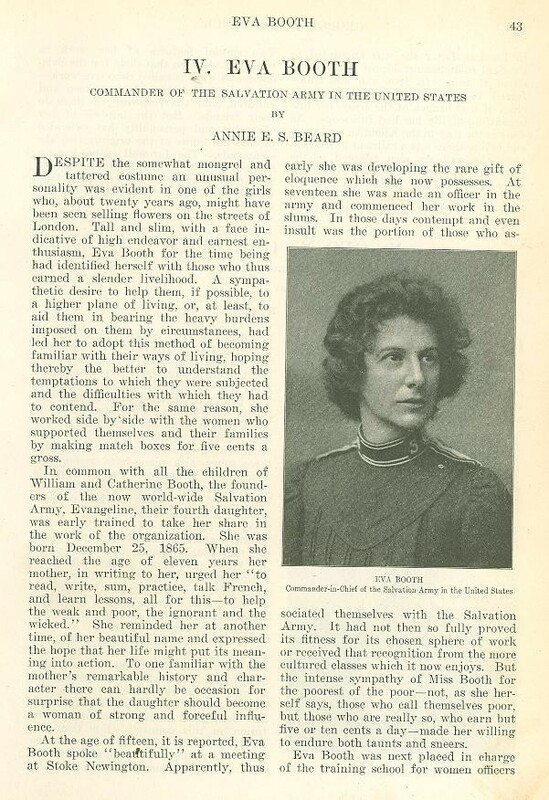 The farewell given to her on leaving Canada, to take command of the Salvation Army in the United States, bore witness to the respect and esteem she has universally won. Originally published in The World To-Day Magazine, February 1905. 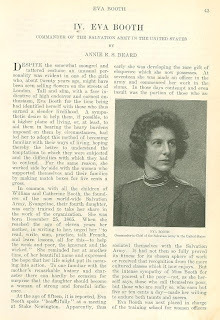 Written by Annie E. S. Beard.